I was having a long talk this week with a business partner about workshops for biopharma sales training. 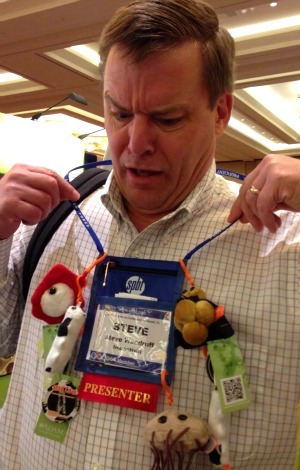 Back when I was immersed in the technology aspects of training, I didn’t pay much attention to live workshops. But 7 years ago, upon starting Impactiviti, I came to realize how big a role workshops play in our environment. And, I now facilitate my own workshops, on Vendor and Project Management (as well as some other topics). There are purely off-the-shelf (standard) workshops, semi-customized standard workshops, and fully-customized workshops. And one of the things I’ve always wondered is this: do off-the-shelf workshops, by and large, truly resonate with the audience and all the surrounding stakeholders? Or are they often too general to really have high impact? Are fully-customized workshops, perhaps including some up-front assessment and post-hoc impact-measurement, too costly for most needs? Some material may lend itself to a more off-the-shelf approach, but I’m guessing there are swaths of topics that really need a more custom approach. Which topics are best suited for which approach? I’d really love to hear which workshops seem to ring the bell best with your customers, and how much customization you feel is needed in most cases. You may not want to leave a blog comment but please send an e-mail to swoodruff at impactiviti dot com with your thoughts. I’m always seeking to better understand what clients need and what seems to be working best. Last week, I enjoyed several days of learning and networking at the annual SPBT (Society of Pharmaceutical and Biotech Trainers) conference. It was held at the impressive Peabody Hotel (Orlando), where ducks rule. Which is cute; though I’m sure no-one is going to launch a boutique hotel chain any time soon with, say, angler fish or centipedes as the designated mascot. The pool was nice, too. Oops, we’re back into extracurriculars. OK – to business. SPBT’s leadership has been in a steady changeover mode for the past few years, and I say this with appreciation – the new leaders are forward-looking, invested in seeing the organization grow and adapt, and willing to try new approaches. And that leads to my main observation summing up the entire conference this year. The SPBT was upbeat and energetic. Yes, we’re still facing challenges with membership numbers and exhibitor commitments. Yes, the industry keeps changing rapidly under our feet. But something else was missing at the conference this year, and I didn’t miss it at all. There was energy in the exhibit hall (and I heard very little of the complaining I’ve heard in past years). There was energy around the new formats for learning and networking opportunities provided. There was energy around the idea that the organization is pro-actively looking to the future, including a name change to more accurately reflect its evolving membership. On the other hand, there was rampant disease-spreading, thanks to the fine folks at A.D.A.M. I ended up with MRSA, E. coli, chickenpox, and mad cow disease. —-> You? As for the keynotes, Peter Diamandis was top-shelf (do understand that I have a real fondness for futurists). His stories and perspectives were mind-stretching. Sally Hogshead was entertaining and thought-provoking with her ideas on what makes people fascinating. Linda Cohn (ESPN anchor) did a fine job trying to interview Misty May-Treanor, but this talented Olympic champion, awesome at beach volleyball, was not made for the stage. I’m trying to be diplomatic here. Hey, if I tried to do competitive beach volleyball….let’s not go there. Since any one person can only attend a handful of workshops, it’s impossible to give a broad overview of the many sessions that took place. My favorite this year was on Getting Your Message Heard, by Patricia Scott (Uhmms) and Susan Velani (Genentech). This very practical session on effective communications led me to immediately go back to my room and make some changes to my upcoming presentation the next day. Since Uhmms is an Impactiviti partner company, if you need great communication skills workshops for your company, just let me know and I’ll connect you up. I also enjoyed hearing how Eisai handled the seemingly impossible task of a six-month iPad-centric training implementation. Mary Myers (Eisai) and Susan Caldwell/Jennifer Hughes (Metrix Group) led the workshop. Technology + insurmountable odds? Of course I’m into it. We are now beginning to leave the first-generation of iPad deployment and companies are starting to think about bigger systems. The most interesting tablet days are ahead of us, as we begin to work on the enterprise “plumbing” of mobile communications. I have an entire workshop on The Digital Future in Healthcare. Favorite topic! For SPBT 2013, I got to lead a workshop Thursday on Vendor Management, and it was a fun group of folks with diverse perspectives. Everyone has a horror story (or three – or more) about projects that have gone off the rails. It’s amazing how common the causes are across the board…and how preventable a lot of this truly can be. Appropriately, SPBT did feature some jugglers. They were throwing around a lot of unusual items, keeping up an entertaining banter throughout. Stuff got dropped occasionally, as more and more items go thrown into the mix. Seems like an apt metaphor for the biopharma training role these days. Personally, my favorite aspect of the entire conference was that which I enjoy most – long, brainstorming talks with clients and partners. I put on my (learned) outgoing disposition for these events but I will always be a one-on-one, dig-deep kinda guy. In that respect, I wish the conference went much longer – there’s never enough time for relationship-building. But I left happy and upbeat. SPBT is in good hands. I look forward to next year in Dallas! Need expert recommendations selecting your vendors? Plug Into Impactiviti! I’m happy to announce the Client-Vendor Success White Paper – a collaborative effort between Impactiviti, pharma training professionals, and the outsource vendors who serve them. What are the Top 10 things clients wish vendors understood (or would do better) – and vice-versa? Here are the answers, in one brief and engaging white paper. An outstanding message that makes clear what you’re about. Ummm…what’s the differentiating message here? None. Nada. Generic, vague biz-speak (they even claim in the text above that they “don’t subscribe to the routine or generic” – ha!). 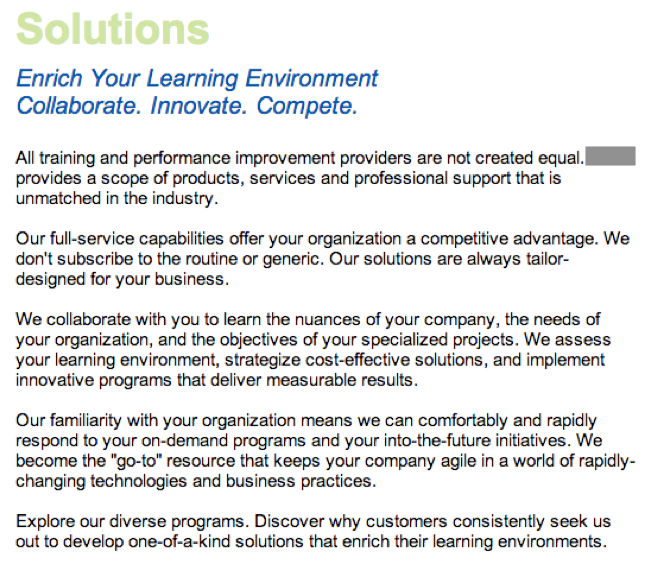 It’s a bad case of JATS (Just Another Training Supplier) marketing. If your description could fit just about any other company you’re competing with, then you don’t stand out. You need to discover your fit in the marketplace and express it with clear differentiation. I’ve worked with many of my training partners to help them define their offerings, refine their message, and focus their marketing (see Clarity Therapy). If you need something better than generic branding, let’s talk. Commodity messaging won’t make you stand out, even if you are outstanding.